In recent years there has been a renewed interest in Civil War sharpshooters. Now there is a new perspective on the subject in the story of Major William E. Simmons (1839–1931), with emphasis on his experiences as an infantry officer in the Army of Northern Virginia. Three years after graduating from Emory College, Simmons joined the first company in his home county and received his commission. He was later promoted to Captain in the elite 3rd Battalion Georgia Sharpshooters of Wofford’s Brigade. In 1864, he became acting commander of the brigade’s sharpshooter battalion. The book traces his family heritage and his footsteps from childhood to Emory College, through many challenging war encounters, his capture and imprisonment at Fort Delaware, and a lifetime of service to his state and community that lasted until the 1930s. A wealth of information from Simmons’ journal and personal papers includes encounters with Generals Nathan Bedford Forrest and George Armstrong Custer. There are also accounts of his miraculous escape from Crampton’s Gap at South Mountain, his regiment’s heroic efforts at the Bloody Lane in the Battle of Sharpsburg, the Sunken Road at Fredericksburg, the Peach Orchard and Wheat Field at Gettysburg, and his sharpshooters’ key role at Cold Harbor and Wofford’s flank attack at the Wilderness. 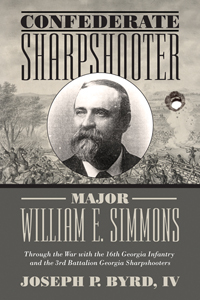 To provide more in-depth information on Simmons’ sharpshooter battalion, Byrd provides maps, letters, photographs, and a roster of soldiers compiled from service records and twenty-five other reference sources.